At Unitmaster, we offer a unique bespoke custom fitted kitchen service. Whether you have a design in mind, or would like us to design a kitchen for you, we will always work with you to develop a kitchen that is practical and meets all your requirements. Our fitted kitchens are made to measure. Even if you have irregular walls, then we can work around them to tailor a custom fitted kitchen to your requirements. Upon your enquiry, our award winning craftsman, Peter Talbot, proprietor of Unitmaster, will personally arrange a visit at no obligation or cost, and talk through the options available. We will then come up with a custom bespoke design for your kitchen and work with you on the design until you are happy. Once you have chosen a kitchen design you are happy with, we will hand craft your kitchen in our own workshops which are based in Bucklesham near Ipswich, Suffolk. Once completed, we will arrange to fit the units and appliances. We offer a complete kitchen service so all appliances (Ovens / Cookers etc) are included in our service. These appliances can be hand picked by you. We have a number of different materials which can be used to create the kitchen units. These include Ash kitchens, Beech kitchens, painted kitchens, Laminate kitchens, MDF kitchens, Mahogany kitchens, Maple kitchens and Oak kitchens. So what ever finish you require, we can provide you with a custom made kitchen. If you are unsure of what material to have, then using our wealth of experience, we can advise you on which material would work best for your design. Using the materials above to custom make your kitchen, we create kitchens with hand painted finished and kitchens with sprayed finishes. A kitchen is never complete without the kitchen flooring or kitchen tiles. We can fit these for you as part of the complete service that we can offer. Again if you are not sure which tiles to choose, we can advise you on what would work best against your chose kitchen units. Aec, Amana, Belling, Bosch, Cannon, Electrolux, Elica, Falcon, Fisher & Paykel, Franke, Hotpoint, Idesit, Lec, Maytag, Neff, New World, Rangemaster, Stoves, Zanussi, Astracast, Grohe, The Kitchen Works, Leisure, Perrin & Rowe, Smart 4, Insinkerator, McAlpine, Tapworks, Consort / Myson, Litestyle, Domus, Miele and Surestop. 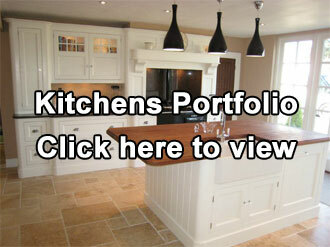 Click here to view our portfolio of fitted kitchens we have designed and installed. All appliances are available free standing or integrate and are included in our kitchen service.